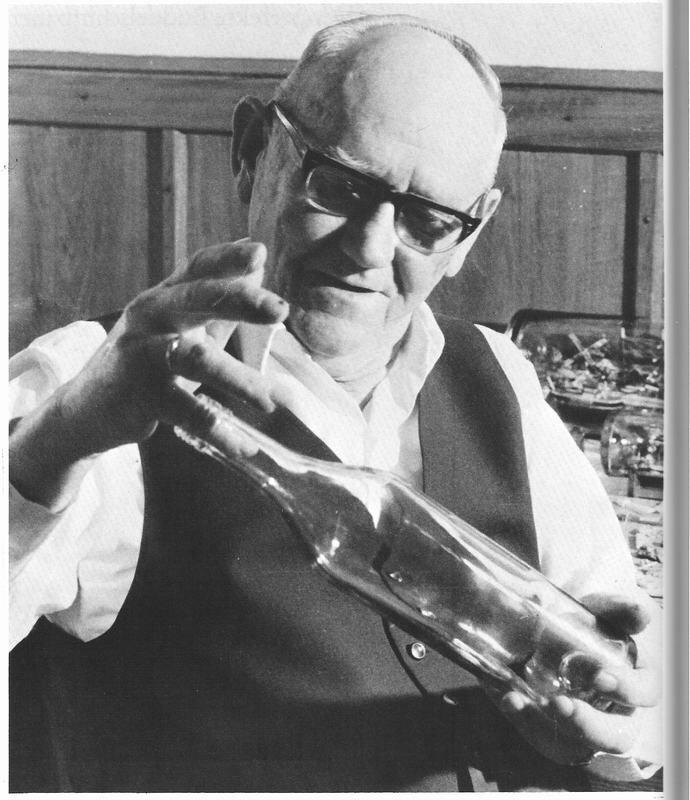 Theodor Carstensen, from Germany, was a prolific digging ship (ship in bottle) builder who did most of his building in the 1950 - 1960's era. In 1974, he co-authored a book, "Der perfekte Buddelschiffbauer", on that subject along with Hans J?rgen Hansen, and Jack Needham. The book, with an introduction by Alan Villiers, was written by experienced ship in bottle builders, Theodor Carstensen and Jack Needham. 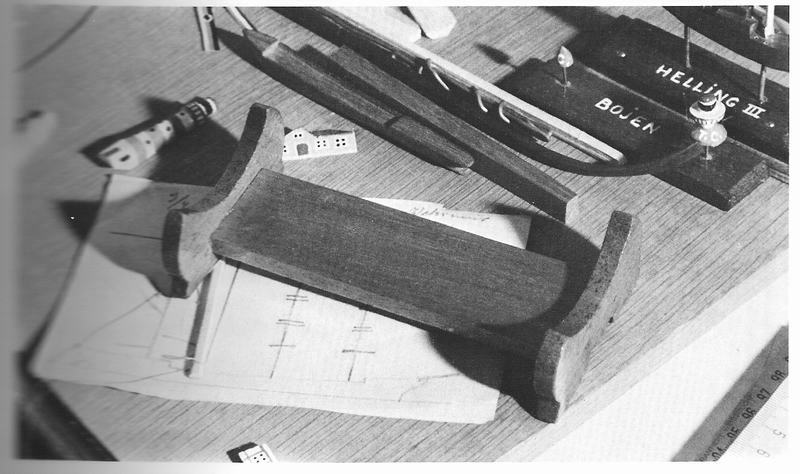 In the book, they show and explain how ships in bottles are manufactured, and they review many of the tricks and techniques of this craft. The nautical historian, Hans J?rgen Hansen, combined the works of both artists and along with over 80 photographs of all details of the work, to provide a descriptive documentation of this maritime crafts tradition. Theodor's bottle are very recognizable through his own unique style. 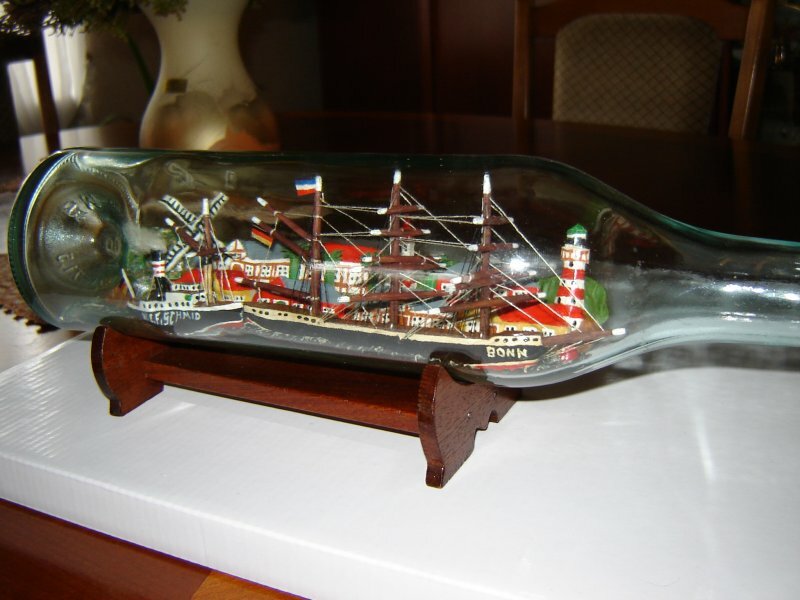 First, his bottle almost always contained a diorama of a ship, without sails, anchored in front of a town or city scene with very colorful buildings, houses, a church, and large windmill with four fans. It was common for him to also build and place a tug boat in the same bottle near the stern of his main ship. The ships were always German, and more often than not, had the name of the ship in rather large and crudely painted white letters. The name of the tug usually appeared as well. Another notable feature of Carstensen's bottles was his "signature" red buoy placed somewhere in the bottle with the letters "TC" painted in white. These letters, of course, stood for his name. He oftened placed a date and his initials in another location in his bottle. His stands were also very creative and unique. He would often use large wood stands with colorful flags, shields and wording on the stand. On the stand pictured, he covered the wood in small mosiac tiles.